Kevin Werbach, a professor at the Wharton School of Business at the University of Pennsylvania, focuses on emerging technologies. As bitcoin climbed to nearly $20,000 in late 2017, the smart money was discounting the cryptocurrency and banking on something even bigger. “Blockchain, not bitcoin” was the common refrain. Blockchain is the backbone on which bitcoin and other cryptocurrencies were built, a startlingly innovative technology that its proponents said was poised to revolutionize financial services, slash bureaucratic red tape, and remake supply chain tracking. But after the bitcoin bubble burst in early 2018, the smart money turned its attention — and began placing its bets — elsewhere. With bitcoin languishing at about $3,850, there isn’t much chatter about blockchain, a database that records transactions and shares it among all participants in a foolproof way, eliminating the need for a central record-keeper. Kevin Werbach, however, is keeping the conversation rolling. Werbach has made a career of embracing the next next thing. 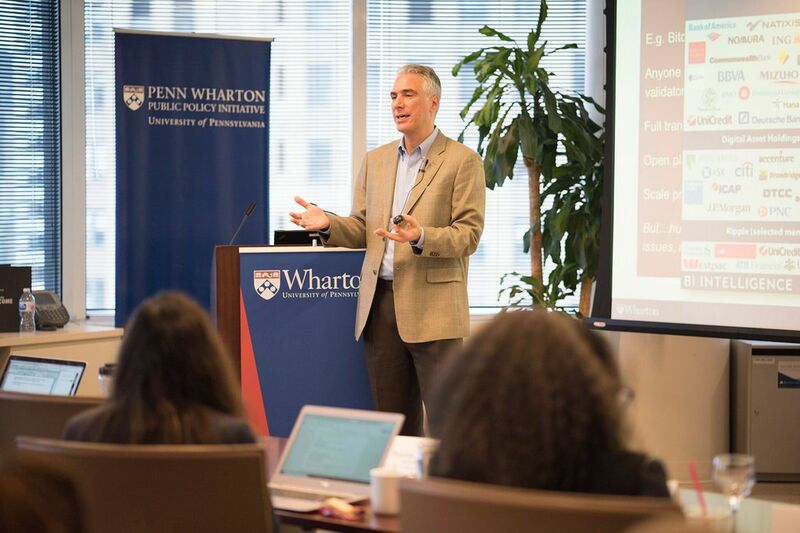 A professor of legal studies and business ethics at the Wharton School of Business, Werbach is a go-to source for information on emerging technologies from broadband to big data, from cryptocurrency to gamification. He was an adviser to the Obama administration’s transition team in 2008 and later went on to create one of the world’s most popular online courses on Coursera. Werbach recently published The Blockchain and the New Architecture of Trust (MIT Press). In it, he says the idea behind blockchain is no fad and will eventually be recognized as transformative. Werbach's book examines the past and possible futures of the blockchain, best known as the backbone of cryptocurrencies including bitcoin. “Technologies take off partly because it’s the right technology, but also because it’s the right time for them,” Werbach said. There were online retailers before Amazon and social media before Facebook, he said. Blockchain’s time will come. As long as there is “a crisis in trust” — with faith in government, corporations, banks, and the law continuing to crumble — there will be uses for blockchain. “The basic idea is, you can be confident in the history of a transaction without having to trust a third party that is recording or verifying those transactions,” Werbach said. That’s because open blockchains are decentralized, stored on hundreds of nodes the world over. Blockchain is a powerful technology, but not without risks, Werbach said. Most of the developments are happening in gated blockchains that are only open to select users, Werbach said. Among Fortune 500 companies dabbling in that area are IBM and Maersk, which teamed to build a blockchain for freight tracking. JPMorgan Chase, whose CEO Jamie Dimon famously lambasted cryptocurrencies, launched its own private blockchain platform and a JPM Coin available to its institutional clients. In academia, the University of Pennsylvania announced last month that alumnus Josh Harris of Apollo Global Management (and co-owner of the 76ers) had made a $10 million gift to establish an Alternative Investments Program at Wharton. Some of those funds will support the school’s Blockchain Venture. The Inquirer spoke with Werbach earlier this month. This interview has been edited for concision. Is there’s a blockchain revolution happening that we just can’t see? Is it happening? It’s very early. There’s a tremendous amount of development going on both with novel kinds of blockchain systems as well as with established corporations and governments. There are a substantial number of real-world implementations. But they’re not at major scale yet. Where is blockchain best deployed? It’s potentially useful anywhere there’s a gap in trust. In practice, there are three broad classes of uses. The first is for tracking things, which is a very common-use case in enterprise business transactions where there’s lots of interest in supply chain and logistics. The value of that is $5 trillion in worldwide shipping transactions. You think of all the goods and services that start somewhere and then involve a collection of different companies modifying and distributing them to the end customer. That’s a big chunk of the world economy. The second category is financial services. Once there’s a secured sense of value in a token like bitcoin, that can be plugged into the world’s trading exchanges. It starts with things like bitcoin and cryptocurrencies, but then builds new kinds of lending systems and financing systems on top of them that can be very powerful. Third, there’s the idea that a cryptocurrency token can be valuable in its own right and can be the input for decentralized applications running on top of the blockchain as a global computer. Blockchain’s been trumpeted as a way of disrupting industries like law and insurance. Is that happening? I think that’s the wrong framing. The truth is that most technologies are not disruptive, and that’s fine. There’s a whole raft of start-ups trying to disrupt the financial system with a blockchain approach. There is low- hanging fruit in financial services and supply chain management, in particular where there is massive inefficiencies in the duplication of records. You write that blockchain isn’t widely used “largely because users don’t trust each other.” Yet you tout blockchain as the new architecture of trust? That’s because blockchain is a new form of trust. It’s not the absence of trust. It provides strong trust in the transaction itself, so you can be confident that, say, this bitcoin went from this account to that account. But that doesn’t tell you anything about what those identities on the network represent. Do you know that the person with the private key is the person you think it is? Are they treating you honestly or trying to scam you out of your money? Any practical uses? Could, say, a news-gathering organization use it? There’s a group called Civil trying to use it for news funding mechanisms. Cryptocurrency tokens provide new means for crowdfunding and potentially micropayments for funding stories. Crowdscourcing mechanisms could be used to attack the problem of ‘fake news.’ If you had some story and wanted to see the veracity, you could have a group of people incentivized based on a token who can vote on what is accurate and what’s not accurate. Kevin Werbach, a professor at the Wharton School of Business, specializes in emerging technologies. Has blockchain been embraced by Wall Street? Some parts of Wall Street are embracing it. There are parts of Wall Street that say, “Give me something to trade and I’ll find a way to trade it.” That’s why you see organizations creating cryptocurrency trading platforms to buy and sell bitcoin. Look below the surface of most Wall Street firms and even though they’re incredibly sophisticated companies, they’re mostly running on string and duct tape, because there is so much legacy systems and manual processes. Blockchain potentially could deal with exactly this situation. Has there been any adoption by governments? There are a variety of experiments. One thing that government does is record a lot of things — birth certificates, property records, stock holdings. Blockchain is potentially one more way of more efficiently registering things. The government of Dubai in the Middle East announced by 2020 it will use blockchain for all the government services they offer to people. Can blockchain be used as a tool against corruption? It can be used to attack corruption, or it can be a mechanism of corruption. So we’re seeing both. We need to embrace the rule of law. Because it’s all well and good that we need to protect some information from authoritarian governments. But if the solution is to build something that insulates criminals from drug dealing, money laundering, or terrorist financing then we haven’t gotten very far. It’s of great interest in places where there is not a great rule of law. But is that really solving a problem? You could just as easily have a human who is putting a corrupt record on the blockchain and the blockchain has no way of determining that. Since finishing your book, what’s changed? We went from a boom to a bust in terms of the cryptocurrencies. When there was a sense that this was a fountain of money, even people not involved in the speculative frenzy were willing to believe that this technology could be radically transformative. Now, I think there’s excessive skepticism. Some of the financial applications are starting to get more real. You see Facebook and others looking at releasing a token for payments. The possibility of micropayment systems as a new economic model for the web is something very interesting and powerful, but has generally failed partly because it needs to be very frictionless and largely invisible for people.